On Saturday, it was 20 degrees and blizzard-ing. One of my brother’s friends organized a trip to Harpoon Brewery, which ended up being a blast. Is there any better way to spend a cold, winter day, than drinking beer with friends? I absolutely LOVED this brewery. Open seating picnic style, wooden furniture, amazing flight selections, yummy fresh pretzels, large glass wall looking out into the blizzard…our group was there for hours and loved every second of it. Andrew gave me a brief tour of campus. 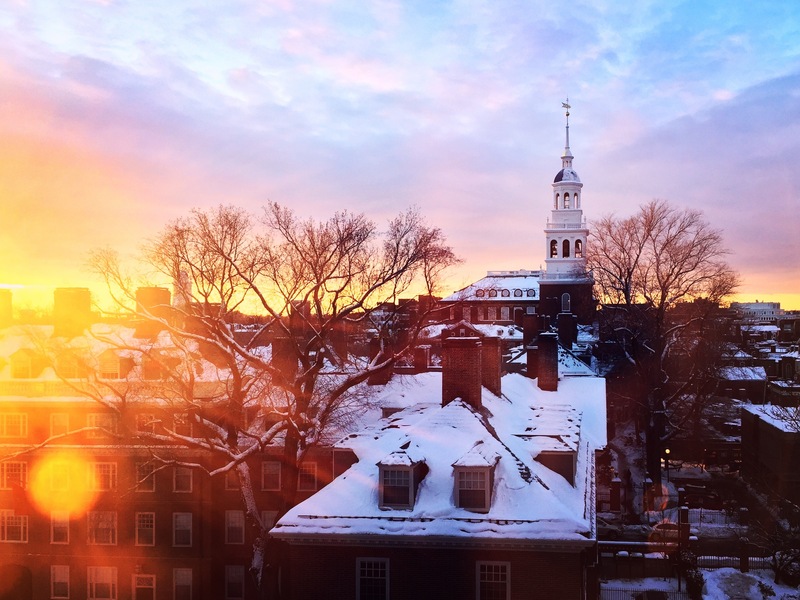 Cambridge is absolutely beautiful, but the snow made us want to get indoors ASAP. Harvard dining hall food…not the greatest. We even did work at a cafe one day. I love that cafes outside of NYC actually have ample space to work/spread out/chill. Fun fact – Boston is not allowed to discount alcohol, so for “happy hour” they discount food. Nonetheless, I so enjoyed our hot drinks on a cold February day. Picture shows Bailey’s hot chocolate. Is there anything better than a beautiful Sunday set? Taken from Andrew’s dorm. One of my favorite parts of going to Boston each year is seeing my brother’s MIT grad school friends. Each time, I see familiar faces and meet some new ones – at this point they feel like family. I’m sad to know that several of them will be graduating this year, so it was very nice to hang out with everyone (possibly) one last time! What better way to have a reunion than to go to party :). There was a lot going on this weekend, and I don’t have pictures for all. We did a whole spectrum of activities from chill nights at bars, to happy hours, to a dinner party filled with yummy food and ample wine, to dancing…my liver definitely needs a rest after this past week! There’s one spot close to MIT campus that has the famous “hobo” = a 40’s beer + a hotdog for $8. I will say, the hot dog was actually very good. On this night, my brother dared the group to drink this “mystery” concoction (you don’t want to know what was in it…), and someone did for $45, ha! I was nothing short of well fed this weekend. My brother knows some pretty awesome spots in Cambridge. One of my favorites was a hole-in-the-wall (or rather, “house”-in-the-wall 😉 ) that had yummy, hearty lobster sandwiches. We also did unlimited sushi at Yomata, a tradition I look forward to when I visit Boston with my brother and his friends – (the love it so much, they go EVERY week!). Hands down the best sushi I’ve had, and for a steal too! Several meals were simply Seamlessed and eaten in in front of the TV with my bro and his roommates. I loved those as much as the other. Eating in really is the best .